· NEW FUNCTION - FLOATING: The suspension / altitude function is very good and can make the drone move at different heights. This will allow you to enjoy more of the view on the screen, and you do not need to have your eyes always put your eye on your drone to control it. So it´s easier to control. When you handle it, and it will be much more fun. · Wifi FPV / LIVE TRANSMISSION: You can use your mobile phone to receive the camera image via wifi, and also record a video or photos from the drone that automatically saves them to your phone, so you can share or edit. 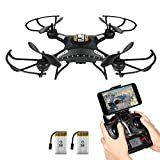 · HD CAMERA AND 2 BATTERIES: The drone comes equipped with a fixed 2MP HD camera with fixed focus, and the image is pretty good, plus it contains 2 batteries in the box.